WHAT HAPPENED THAT NIGHT, Sheila O’Flanagan’s captivating tale of impulsive choices and their lasting effects, is published today in paperback by Headline in the UK, Ireland, Australia and New Zealand today. Lola and Bey’s story will available in paperback in South Africa in late March and in Canada in June. The novel which Heat called ‘a fabulous tale with refreshingly inspiring heroines’ was released in audiobook in June 2017, read by popular O’Flanagan narrator Aoife McMahon, alongside the bestselling hardback edition. 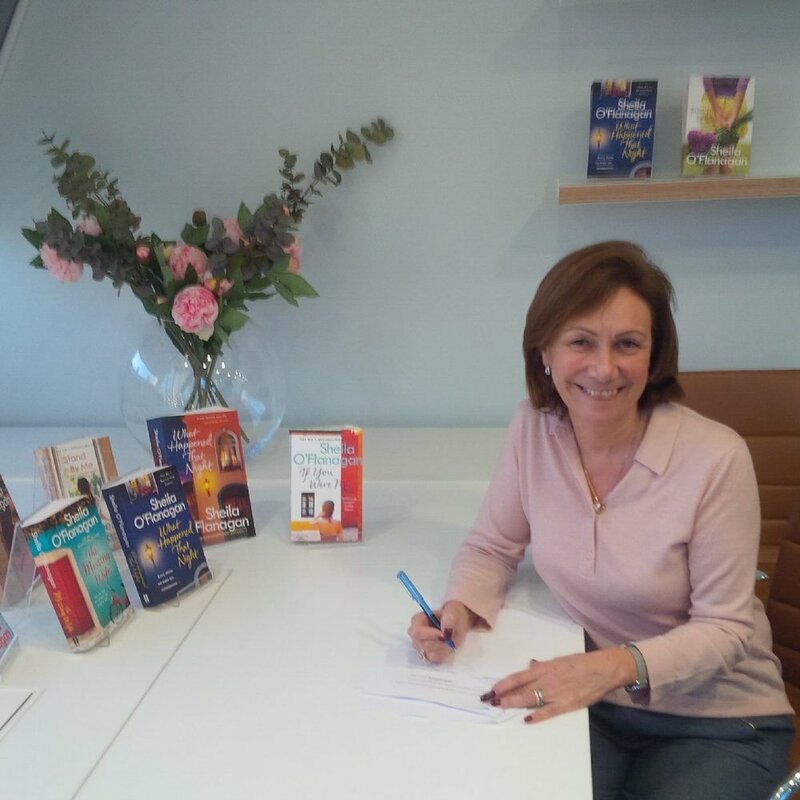 Sheila recently signed a new two book deal with Headline, so fans of her work can anticipate two brand new titles in 2019 and 2020 from the Headline Review imprint. Younger readers have a treat ahead too, as Kaia and Joe return in SHIELD OF LIES, the second instalment of Sheila’s first Young Adult series THE CRYSTAL RUN, which will be published by Hachette Children’s Books on 8 March. THE HIDEAWAY, Sheila’s next novel for adults will be published on 31 May, just in time for summer. Sheila O’Flanagan is the author of twenty-five thought-provoking, gripping and unforgettable Sunday Times and ebook bestsellers, including THE MISSING WIFE which was published in the US this month by Grand Central following its UK success. It became a Sunday Times and Irish Times paperback bestseller in 2017, as well as becoming a No.1 ebook bestseller, and one of Amazon’s Top Ten Bestselling ebooks of the year. Her interlinked short story collection CHRISTMAS WITH YOU reached No. 2 in the Irish bestseller lists in the run up to Christmas. Headline has sold over 7 million copies of Sheila’s books. Visit Sheila’s website, where you can also join her mailing list. Sunday Times and Irish Times bestselling author Sheila O'Flanagan's gripping new novel WHAT HAPPENED THAT NIGHT is published in the UK and Ireland today by Headline! Audiobook fans can also download the audiobook, read by popular O’Flanagan narrator Aoife McMahon. Then: Lola Fitzpatrick is bright and ambitious, but also headstrong and stubborn, a young woman with big dreams. When she catches the eye of wealthy jeweller Philip Warren, she can't resist his charm and confidence. Could life get any better? Not everyone is convinced... But then everything changes, and Lola is faced with decisions that will have long-term consequences she can't even begin to imagine. Now: Bey has inherited Lola's determined nature, but her impulsive decisions place her in danger. A shocking family tragedy forces her to fly to Dublin from beautiful Cordoba, Spain, and meet the Warren family. As she uncovers the difficult choices her mother made many years ago, Bey has to decide who she wants to be: a woman defined by the mistakes of the past, or someone brave enough to risk everything for the future she's always wanted. Sheila’s most recent novel THE MISSING WIFE, published in paperback on 9 March, has been a huge success, shooting to the No. 1 bestseller spot in Ireland and No. 4 in the Sunday Times Paperback Fiction list in its first week of sales. The paperback has now sold over 35,000 copies in the UK, and has broken the Irish writer’s already impressive record for the number of weeks in Ireland’s Top 5. It is currently at No. 4 on the Irish fiction paperback list. In Australia and New Zealand THE MISSING WIFE and MY MOTHER’S SECRET also hit No. 1 and No. 2 on the iBooks Charts this week. THE MISSING WIFE will be published in the US in February 2018 by Grand Central, and rights have been sold in the Czech Republic, Russia, Estonia and Germany. Sheila O’Flanagan is the award-winning author of over twenty novels, including THE MISSING WIFE, MY MOTHER’S SECRET, IF YOU WERE ME, ALL FOR YOU (winner of the Irish Popular Fiction Book of the Year Award) and BAD BEHAVIOUR, as well as the bestselling short story collections DESTINATIONS, CONNECTIONS and A SEASON TO REMEMBER. In 2016 Hodder Children’s Books published THE CRYSTAL RUN, her first book for younger readers. The paperback came out in May 2017, with the follow-up THE CRYSTAL RUN: SHIELD OF LIES due in 2018. Sheila was awarded the prestigious Irish Tatler Woman of the Year Award in 2003, and currently lives in Dublin with her husband. Her books have sold over 6.5 million copies in English alone.